Commercial Properties has earned the reputation as one of Maine’s most respected property management firms. We pride ourselves on providing excellent service to our clients and their tenants. 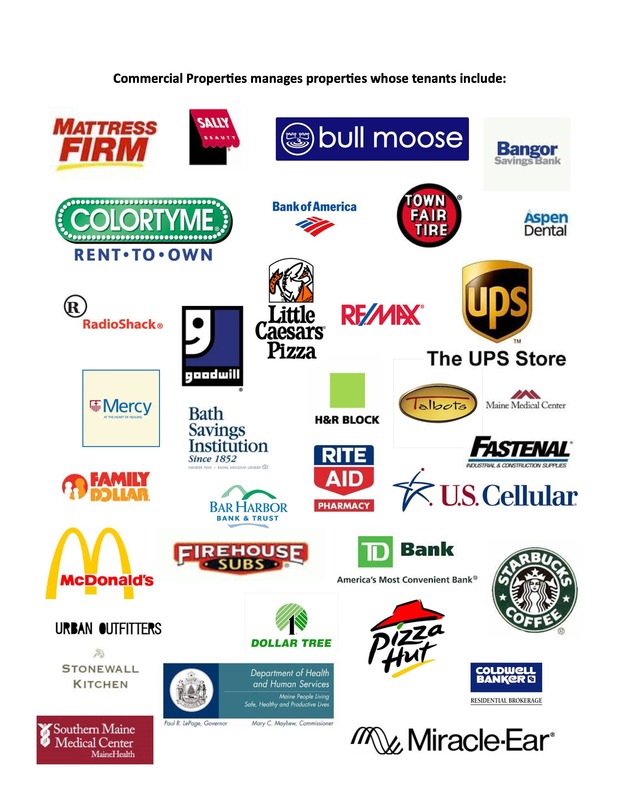 Commercial Properties Management ("CPM") was established in 2001 in Portland, Maine and currently has a management portfolio 1.9 million sq ft. of retail, office, medical, residential, and condominium properties. Commercial Properties Management LLC (CPM) was established in 2001 by Richard McGoldrick to manage his growing portfolio of development and investment properties. CPM has since expanded its client base to include third party commercial and residential management. CPM has since expanded its client base to include third party commercial, residential, and condominium management. Her duties range from “helping answer financial questions for owners, preparing financial documents, working with mortgage companies, and performing human resources duties,” she says. “I make sure tenants are paying rent and mortgage payments, that the financials are in order to pay vendors, and that insurance documents for vendors are all in place.” Karen is a Notary Public and holds both a Maine Associate Brokers License and a Certified Property Manager designation. She is also a member of MEREDA, where she is part of the Marketing/Membership Committee. In her spare time, Karen enjoys gardening, traveling, hiking, volunteering, and spending time with family and friends. “Tenant retention is my prime objective for each building. I love the relationships I have with all the tenants; they become family to me. " Originally from Brunswick, Maine, Abigail received her Associates Degree in criminology, and pursued her Bachelor’s Degree in Business Administration at the University of Southern Maine. According to Abigail, “I love real estate and business. Coming from an entrepreneurial family, I always knew that I wanted to get into this industry.” Abigail is also very dedicated to broadening her knowledge of the industry and furthering her education. Currently, she is pursuing her license as a notary and working toward her designation as a Certified Commercial Investment Member (CCIM). Abigail currently lives in Freeport with her family. "When a tenant has a thriving business, the Landlord does too. I enjoy being part of that relationship." Patty Dugas joined Commercial Properties in 2008 as our Lease Administrator. Prior to joining our team, Patty spent fifteen years managing tenancies for one of the largest convenience store/gas station chains in the County. Collectively Patty has over 20 years of experience in managing all aspects of the Tenant/Landlord relationship with hundreds of both "Mom & Pop" and National Tenants. Daily activities include: Tenant/Landlord liaison; accurate accounting of Tenant receivables; maintaining and tracking critical dates (commencement, expiration, option periods, etc) through RE software; Lease enforcement (defaults/notices); securing proper insurance certificates; various utility, tax, and operating expense billings (monthly, quarterly, annual escrow reconciliation); document drafting (leases, amendments, mutual terminations, commencement notices, etc.) securing Estoppel Certificates and SNDA's. Recently Patty became an Owner of Commercial Properties Management and states: "It is an exciting time for our Company. We are truly committed to providing our clients with consistently high level of attention and service." Leonard joined Commercial Properties Management in January of 2015 as a temporary employee to assist us through the busy tax season. We learned of Leonard’s eagerness to tackle difficult jobs and how well he fit in with our team and are pleased that he joined our team permanently in July. Leonard is working closely with the CFO and Leasing Administrator to provide timely accurate reporting to owners and billings to tenants. Leonard has a great eye for detail and enjoys a challenge. Previously, Leonard served in both the U.S. Navy and the Massachusetts Army National Guard. He received a Bachelor’s Degree in Spanish from Bridgewater State College and held a Residential Real Estate Sales license and a Construction Supervisor license. Leonard was the owner/operator of Berube Carpentry for several years before moving to Maine in 2010. After moving to Maine, Leonard received a Certificate of Accountancy from the University of Southern Maine. When Leonard isn’t working he enjoys home improvement projects, church fellowship and spending time with his wife and two children. Caroline moved to Maine from Boston and joined Commercial Properties Management in the Fall of 2016. Before joining the CPM team Caroline was the Operations Manager at one of Boston's Financial District High Rises where she assisted in managing the 800,000 square feet downtown tower. Caroline is a graduate of Endicott College where she got the opportunity to spend a semester studying abroad in Florence, Italy. Caroline lives in Portland with her Husband and Golden Retriever Buoy. In her free time Caroline enjoys spending time with her family and friends, cooking, and going on hikes with her dog. Josh returned to the Commercial Properties Management team in 2018 after some time away working for Cushman & Wakefield in Providence, RI. Josh’s primary responsibilities with CPM include the day-to-day site operations, including contracting of vendor services, managing repairs and tenant fit-ups, obtaining bids and building permits for capital projects, coordinating preventative maintenance and the preparation of annual operating budgets. Josh brings extensive knowledge through experience to the Commercial Properties Management team having worked for Cushman & Wakefield in and around Boston, MA and Providence, RI for over 10 years. Having managed over 2.5 million square feet of class A and B office space his most notable assignments would be downtown Boston’s historical South Station, 470 Atlantic Avenue which sits at the sight of the Boston Tea Party and the newly constructed South Street Landing building located in downtown Providence, RI. A native of Cape Elizabeth, Maine, Josh earned his Bachelors of Science degree from the University of New Hampshire while also participating on the Men’s Division 1 soccer program. In his spare time, Josh enjoys all outdoor recreation, traveling, and spending time with his wife and two children. Melissa joined Commercial Properties Management in April of 2018 as a Property Manager. Melissa's primary role at CPM is managing the Residential properties in the portfolio which includes single family homes and apartments, which currently totals over 100 units. Those responsibilities include: day to day site operations, Residential leasing and lease administration, managing repairs and tenant issues, contracting vendor services, obtaining bids for capital projects and coordinating preventative maintenance. Melissa also manages a portion of CPM's commercial portfolio. Melissa brings extensive knowledge through her experience working as a Property Manager at a Residential Luxury Rental Company in Southern Maine for over 10 years. Having managed over 200 Residential properties she is proficient at leasing and maintenance, solving complex problems, fielding complaints and issues, and getting repairs taken care of quickly and efficiently. Originally from Brunswick, Maine, Melissa earned her Bachelors of Science degree in Psychology from the University of Vermont and a Master's Degree in Forensic Psychology. Melissa grew up submerged in Real Estate coming from a family full of entrepreneurs and Real Estate Agents. In her free time she enjoys taking long walks on the beach, gardening and cooking with friends and family. Corinna recently joined Commercial Properties Management (“CPM’) as their Business Manager. Her primary role is to oversee all Human Resource functions and to prepare and monitor annual operating budgets for the companies multiple divisions. She is also responsible for CPM’s receivables and monitoring its financial obligations. Before joining the CPM team, Corinna was an Accountant for a Maine based petroleum distributor, for 5 years, where she was responsible for tax returns, financial analysis and reporting. She was also involved in lease drafting and real estate transactions. Corinna received her Masters Degree in Business Administration and a Bachelors Degree in Accounting from Husson University. In her free time, Corinna enjoys spending time with her husband, three children and granddaughter. She also loves to travel. The Caribbean is home to some of her favorite destinations. Biggs is originally from Iowa, lived in Oregon for four years, hiked all of New Zealand and for his 31st Birthday he moved to Maine for the lobster life. He joined Commercial Properties Management in the winter of 2017 and is more than willing to lend a helpful set of hands on any projects big or small you have. Biggs is a graduate of the University of Northern Iowa where he became the Cedar Valley’s afternoon radio personality and his friends favorite wedding DJ. He’s had his hands on a variety of projects throughout the years ranging from building museum exhibits, putting together backyard patios, setting up sound and lighting for events and he even assembled a deburring machine in South Korea! In his free time Biggs loves to waterfall chase, fly his kite on the beach, van camp, dance to live music and his favorite hobby is raptor attacking state high points...you’ll have to ask him about that one. With a background in Bookkeeping and Payroll, Karen volunteered to serve as Treasurer on the Association’s Board of Directors in 2008, where she owned a condo unit. That sparked an interest in Condominium Association Management, and the acceptance of an offer to manage her 47-unit Association. A year and a half later, this would lead to working full time for a Property Management company as an Association Manager, with a portfolio of up to 19 condominium associations, each ranging in size from 6 to 112 units. She has managed converted mills, townhouse-style units, mixed use properties, and high-rises. After managing communities for almost 9 years, Karen decided to branch out into managing commercial properties. In September of 2018, she began working for Commercial Properties Management, with a portfolio of retail buildings and Condominium communities. Karen attended classes at the University of Maine and Southern Maine Community College, with a focus on Business and Psychology courses, and earned a certificate in Human Resources Management. Karen has been an active member of the Community Association Institute for 7 years. In her free time she enjoys volunteering for local dog rescue organizations and has three dogs of her own, all adopted from rescue groups. Darlene has lived in Maine all her life. Before coming to Commercial Properties Management, Darlene most recently worked at Prime Self Storage as a Manager. She is glad to be back working for a Company where she can put her property management skills to work. Prior to Prime Self Storage, she worked at Phoenix Management for 5+ years as an Assistant Property Manager where she got her COS (Certified Occupancy Specialist) certificate. Darlene has 3 children Deven 21, Delaney 18 and Desiree 17. She enjoys spending time with her children, going camping and going to the beach. Judy joined Commercial Properties Management in April of 2017 as the Administrative Assistant. With a Masters of Adult Education degree from the University of New Hampshire, paired with her enthusiasm for new responsibilities and having recently completed certification as an accounting clerk, Judy joined the Lease Administration team as the Lease Accounting Administrator in April 2018. She works closely with the team securing proper insurance certificates; and preparing various utility, tax and operating expense billings (monthly, quarterly, annual escrow reconciliations). Judy’s background includes having grown up on a dairy farm in Gorham where she visits often enjoying time spent with family and reminiscing about “farm-life”. She lives in Gray with her husband and three cats. In her spare time she loves combing the beaches of Maine for sea glass and other treasures that she creates craft projects from. Richard McGoldrick founded Commercial Properties Inc. in 1978 and has initiated or participated in the development of over four million square feet of commercial space in Maine. Richard is also a founder and officer of Commercial Properties Management LLC, which manages 53 properties in Maine; and Silver Street Development Corporation, which owns over 8,000 apartment units in 13 States. Active in the community Richard has served as: a former member of the Board of the Finance Authority of Maine (Chair 2000-2002); former co-chair of the Annual Auction of the Boys and Girls Club of Greater Portland and a member of the Investment Committee; a founder and former President of the Maine Real Estate and Economic Development Association; a founder and Board Member of the Maine Business Alliance; McGoldrick serves on the board of Bangor Savings Bank and Bangor Savings Foundation. Our management services strengthen every aspect of your valuable asset. No two properties are the same. And neither are any two owners. At Commercial Properties, our management team knows how to make the most of your valuable and unique asset and keep you up to date on what you think is most important. From negotiating with tenants, managing the financials, and maintaining the value in your property, Commercial Properties becomes your trusted guardian. Designed by Crooker Designs L.L.C.